“Steel Workers - Backbone of America” 12 1/2” x 16” Tin Sign | BUDK.com - Knives & Swords At The Lowest Prices! With stunning, brilliant artwork and an important message, this awesome tin sign pays homage to the men and women who wield blinding torches, pour red-hot molten metal and move mammoth beams with nothing but good old American muscle - all to fabricate and maintain the very skeleton our nation. “Steel Workers” is emblazoned across the top of the sign, and “Backbone of America” and “The Men Who Built Our Nation” are printed boldly along the bottom in letters resembling polished steel. What a fantastic truth and heartfelt tribute to our strong, hard-working steel workers! A vibrantly colored, amazingly detailed image of a steel-forged human skeleton is sandwiched between the two slogans. The hard-as-nails steel skeleton wears a welding helmet, wields a flaming torch and is flanked by welding tanks and equipment. He towers gracefully above Old Glory, glaring with a resolute, fearless expression. This cool tin placard features authentic-looking weathering and wear, tastefully mirroring America’s aging steel factories. At 12 1/2” wide x 16” high it’s perfectly sized and beautifies any space - garage, man cave, workshop, living room, bedroom, kitchen and more! There’s really no wrong place to hang it! Get two - one for yourself, and one to gift to a steel worker in your life. It makes a terrific, heartfelt “thank you” present, and, best of all, it’s easy to get as many as you want with our unbeatable prices! 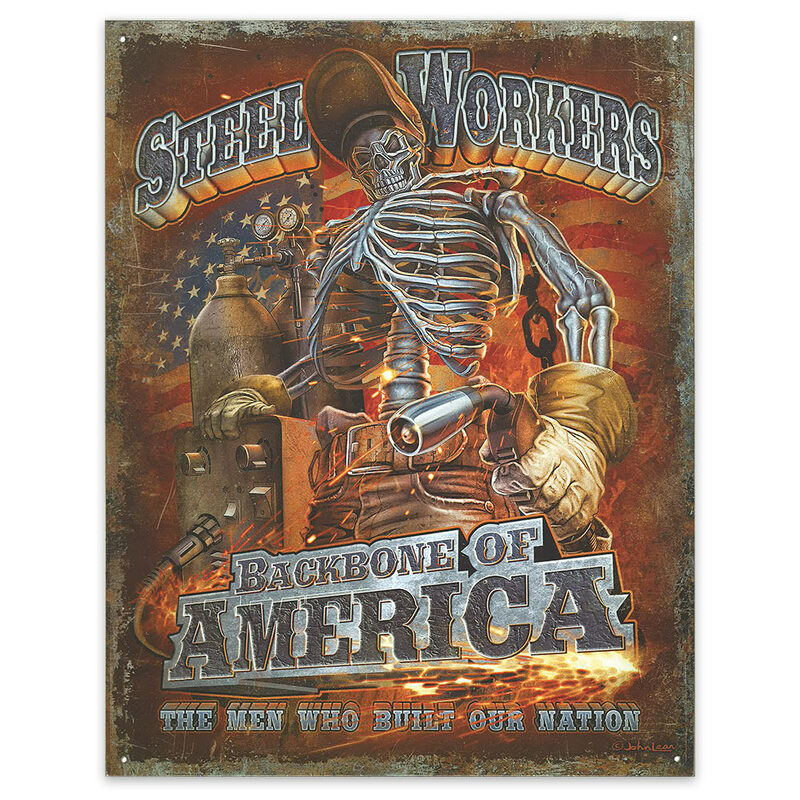 No matter how many you get, or where you decide to hang it, get ready to turn some heads with the eye-catching “Steelworkers - Backbone of America” Tin Sign! Vintage Style Tin Sign - Welcome Smile for Flash - Gun Pistol Revolver Handgun Bullet; Antiqued Weathered Patina; Green - Reloading Room, Garage, Man Cave, Bar, Cabin, Home Decor - 12 1/2" x 16"